June 2015 marked the inaugural event, "Fish on For Freedom", held in our home waters of Ludington as a token of thanks from our community to the men and women that have sacrificed so much in making this nation what it is today. The nonprofit organization took applications for the tournament and then notified all participants of their acceptance into the event. 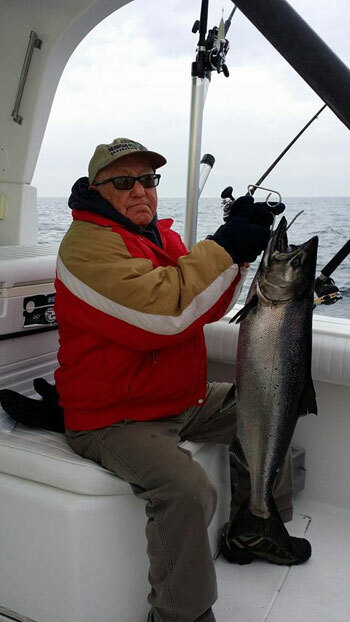 In 2018, 120 veterans participated in a free salmon fishing trip on 29 charter boats with captains to guide the trip. The captains line up their boats for a 6am tournament-style shotgun start outside the pierheads, then head off to fish until 12pm, when a welcome home procession led by the United States Coast Guard and Ludington Fire Patrol boat enter the harbor. After the boats are docked, participants are honored at a weigh-in event and luncheon for all guests and volunteers of the morning’s activities. After the fish have been weighed, guests fed, and fishing stories exchanged, awards are given for the day’s fishing activities. The evening before the event, veterans are treated to a Meet & Greet with their captain and crew for the day of the tournament. All Participants must be present to register for Thursday event.